I am Geoffrey Allum MICB (Comp) PM.Dip, the owner of Allum Book-keeping Services. We are based in Weymouth Dorset as a Certified Bookkeeper practicing under licence from the Institute of Certified Bookkeepers, the largest bookkeepers professional body in the world, in the unlike event that anything should go wrong we are fully covered with professional indemnity insurance, you can be assured that your business accounting is in safe hands. These are the main programs we use but are always looking at new software available. So if you wish your data on a different system this should not be a problem. As certified bookkeepers and members of the Institue of Certified Book-Keepers, We undertake CPD (Continuing Professional Development). to ensure that we keep our qualifications up to date. We offer a free inital consultation allowing us to assess your requirements. This will include the range of services we offer that you wish us to undertake for you. From this consultation we will also be able to provide you the cost for our services. For local business you have option for you to drop off your documents to us, or we can also collect them from you. Returing them with an agreed time period complete with any reports you require. Alternatively for client further afield you can send your documents by post, email or Fax. We are happy to collect documents from anwhere in Dorset, including but limited to Weymouth, Dorchester, Portland, Bridport, Blandford, Bournemouth, Poole, Christchurch and all the towns between. 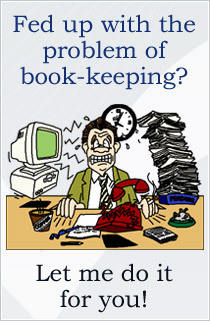 You can also have your bookkeeping done on your premises if you are based in Dorset or Sommerset. If you are further afield we may know another bookkeeper we could recommend to you. Most small traders chose to have work done Monthly, Limited Companies with a lot of transactions tend to have work done weekly and one man bands with not many transactions and not VAT registered chose for work done annualy with the Self-Assessment at the same time. If you would like the work done at a different frequency we should be able to help. We are fully committed to delivering a service that not only meets, but also exceeds, the expectations of our customers. This is demonstrated by our values and never-ending devotion to obtaining 100% customer satisfaction.